Richard Shannon’s potent play, updated. Aung San Suu Kyi, guest director of this year’s Brighton Festival, has been such a potent absent-presence in the public imagination that it’s almost jarring at the start of The Lady of Burma to find her given voice. But thanks to the beautiful concision of Richard Shannon’s writing, Owen Lewis’s careful direction and a performance of quiet dignity and authority by Liana Gould, this play – updated for the Festival to take into account Suu Kyi’s release from house arrest last year – is testimony not only to the Nobel Peace laureate’s indomitable spirit but to the enduring power of speaking out and being heard. It’s tricky when writing a play about a real person to strike the right balance between biography and art; to take the facts and produce something more than a history lesson. And this problem becomes even more acute when you take as your subject someone like Suu Kyi, an icon of human rights in Burma and around the world. How do you give her story dramatic integrity and meaning while keeping it true? Shannon’s solution is to structure his play as a confessional, using the recollections of acquaintances, her own words and his imagination to show Suu Kyi reflecting on the events that have brought her to the bleak, featureless cell from which she now addresses the audience. This approach works well, combining episodes of personal tragedy (the death of her mother, her sadness at not seeing her children grow up or her husband, Michael, again before he died) with her fury, as a citizen and opposition leader, at the barbaric actions of the military junta that, to this day, has Burma in a stranglehold. These fragments of memory coalesce to form a portrait of Suu Kyi that is both vivid and, at times, unfamiliar. Her fond recollection of punting down the River Cherwell in Oxford, where she once studied and lived, is as moving as it is unexpected. 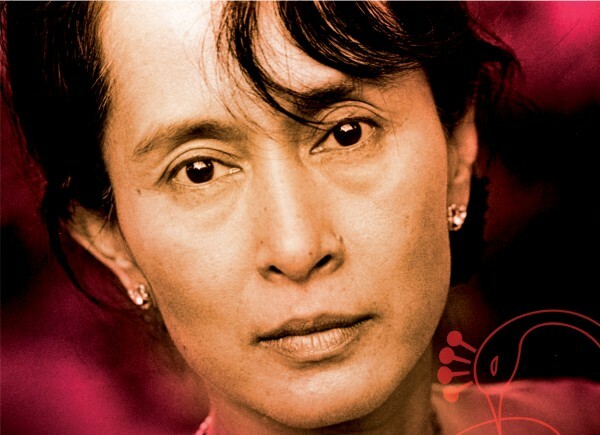 While the regret expressed by Suu Kyi at leaving her family behind to stay in Burma is poignant, the play is at its most hauntingly effective when she gives anguished vent to feelings of responsibility for the deaths that have occurred in her name. At these times, Shannon gently pushes the public image to one side to show the woman behind the symbol and, without sanctimony, the complex cost of freedom. Sustaining an audience’s attention while delivering what is essentially an hour-long monologue is no mean feat; but it’s one that Gould (after an admittedly slightly stilted start) achieves as Suu Kyi. Tall, self-contained and graceful, she moves with a purpose and bearing befitting the daughter of a man who helped to bring about the end of British colonial rule in Burma. Switching effortlessly from wry cynicism when talking about the military’s obsession with giving itself new names to incredulous horror at its wholesale slaughter of peaceful student protestors, she takes Shannon’s words and animates them in such a way as to collapse the distance between stage and stalls. Subtle changes in lighting and the occasional harsh burst of machine-gun fire add to this sense of immediacy. The first version of this play ended in darkness, including the lights going down on Suu Kyi collapsed on the floor. Now, she walks to the front of the stage, announces her recent liberation and talks inspiringly of the impulse towards freedom. It’s an optimistic moment. Nevertheless, Shannon is careful to strike a note of caution. The junta remains in power and Suu Kyi has been released from house arrest before. This is not the conclusion of her story; it’s another chapter. A clear-sighted, passionate and intelligently acted meditation on the need for vigilance in the pursuit of human rights, The Lady of Burma is on for one more night at the Theatre Royal. Go and see it. Tom is a freelance writer and editor, based in London. He has acted in the past, but the stage is undoubtedly better off without him on it. As well as regularly contributing to Exeunt and OffWestEnd.com, he reviews for Time Out, has reviewed Broadway productions for The Telegraph. He has also written for The Guardian and the online world affairs magazine openDemocracy.